Having my daughter home for the summer gives me an excuse to try some fun projects that are more suited to the younger crowd. 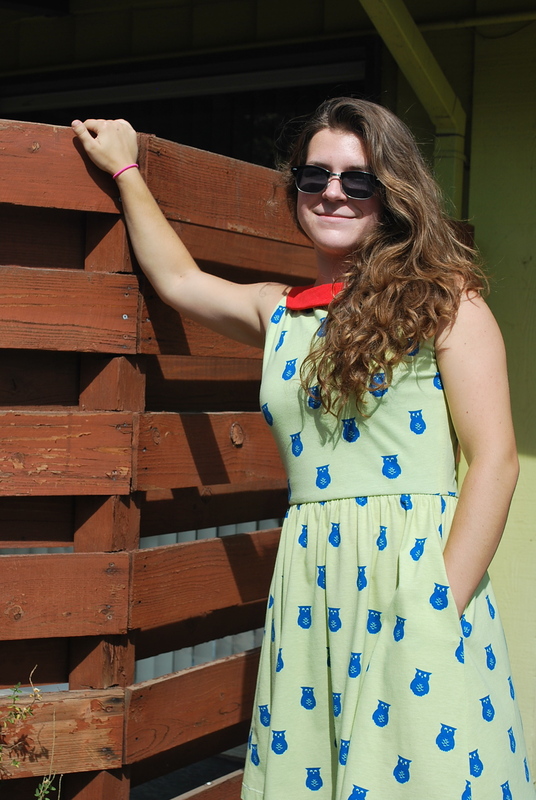 For Fresh Make #13, I decided to make Hanna a Moneta which is an indie design by Colette Patterns that is wildly popular with the online sewing community. 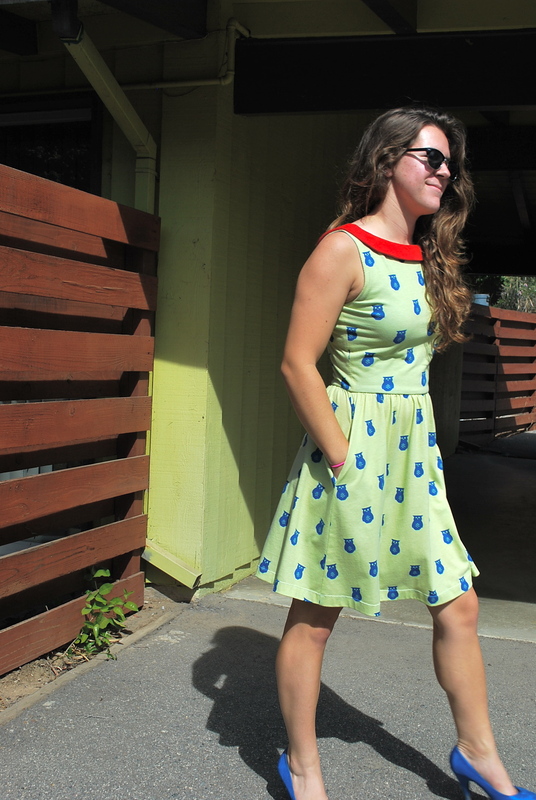 The Moneta is available online as printed paper pattern for $18, or as a PDF for $14. I splurged for the printed pattern plus an additional $5.50 for shipping because I’m not fond of PDFs, and I was curious to see the hip graphic design and packaging. Now, $23.50 is a lot for me to spend on pattern, but I felt I needed to try an indie pattern to keep up with the online community. 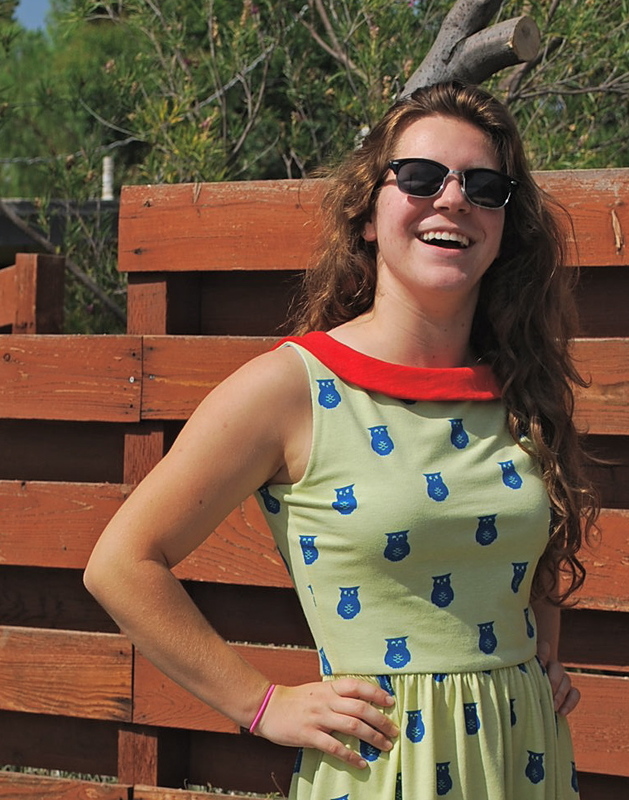 I have to say, the dress is adorable and a smartly designed pattern. I will save my knit picky comments to the end of my post. The fabric I chose is from the online store, Girl Charlee. I have to be honest that I hesitantly ordered from them as I have been disappointed in their fabrics more than once. I was swayed by the claim that the fabric was made in Los Angeles, and I like to buy American made if possible. Unfortunately, this fabric was no improvement over my past purchases. Basically there is very litte stretch in this single knit jersey and the design is printed significantly off grain. Previously I thought it wouldn’t be cool to bad mouth a resource, but I recently read a post in another blog in which the author chose to be honest about her disappointment in Girl Charlee, and then several readers commented that they felt the same way about the site’s products. Shouldn’t we be truthful in a blog? The bodice calls for lining. I always like to find something in my stash for linings and such. I used a recycled t-shirt. 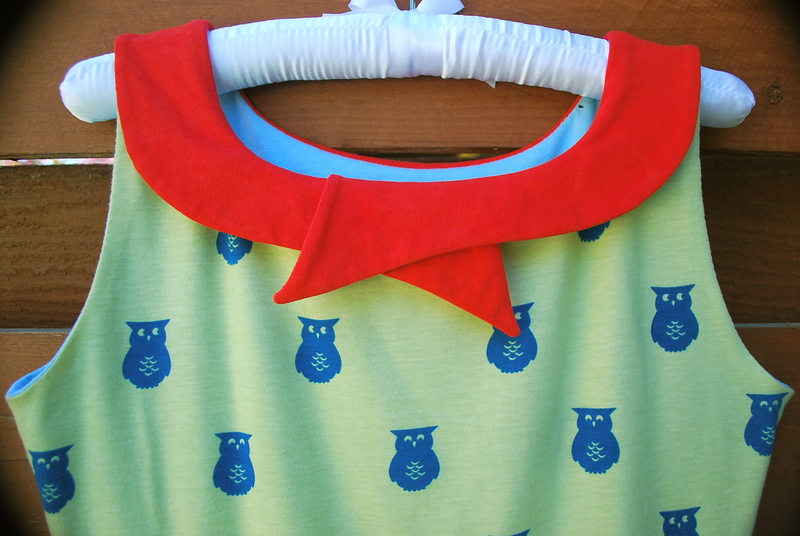 I also used a hand-dyed recycled t-shirt for the constrasting collar fabric. The back neckline is slightly lower than the front. Cool design detail, huh? 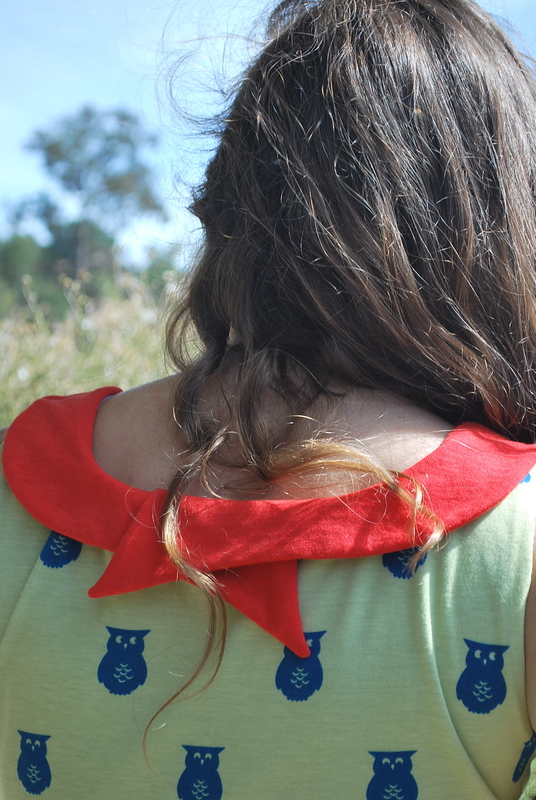 The collar is cleverly sewn with the seam on the outside, but remains hidden when the collar folds over. The bodice is fully lined, and the instructions provide a technique that was new to me for completely machine finishing the armholes. 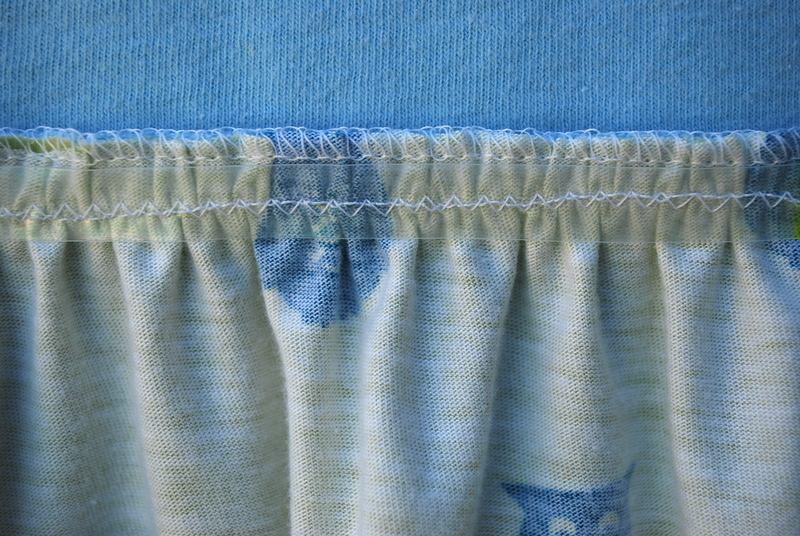 The skirt waist was “shirred” (gathered) with an new version of an old technique of stretching the elastic evenly around the opening and sewing it directly on the fabric. I have done this countless times for elastic waistbands on knits, but never for the purpose of gathering a skirt which attaches to a bodice. The skirt, shirred with elastic, enables the waist stretch when pulling the dress on and off. 1. This pattern is a hip, modern and fresh design for knits. I now understand why everyone loves their Monetas. 2. 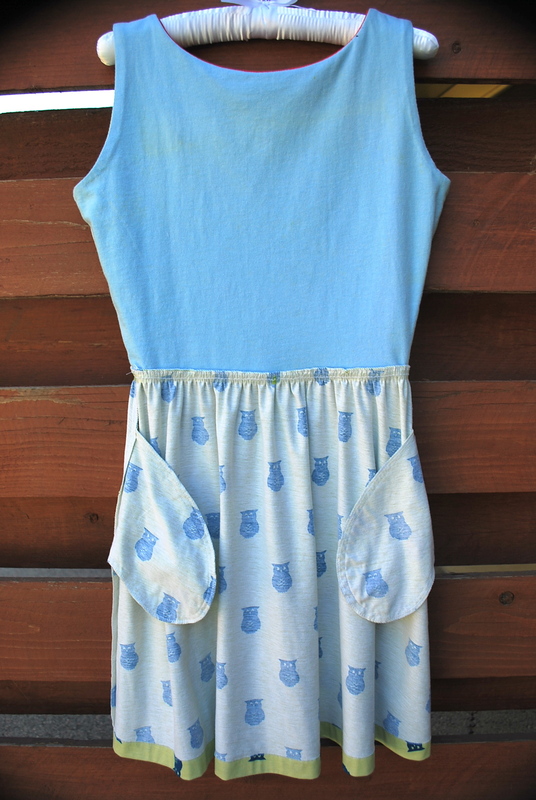 Although Hanna’s measurements more closely corresponded to a SMALL, and the pattern provided an explanation about “negative ease” with knits, I cut a MEDIUM because the fabric had little stretch and the recycled t-shirt I used for the lining was of a thicker fabric. It fit her perfectly for the type of fabric used. I could see though, that if it was made with a stretchy fabric like a rib knit, a smaller size would be appropriate. 3. Please allow me to go on record as staying that I don’t think it necessary or a good technique to serge your 2 collar pieces when it is being flipped right-side out and the bulky serged seam will lie around the inside edge of the collar. This was done on a sewalong I followed, and I’ve seen it done other places online. With knits, even if they curl a bit, I still grade the seam allowances for a smooth outside finish when I am encasing them. A gentle pressing with the iron does wonders too for a nice quality finish. 4. Thoughts on instructions: I know the instructions on the big four pattern companies are ugly and hard to follow. Nobody likes to read them. 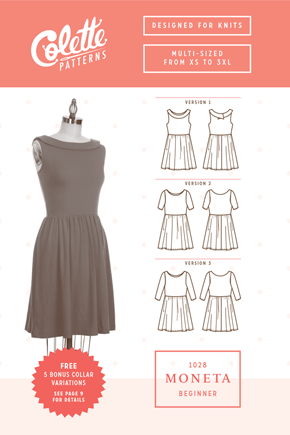 The Moneta pattern comes with a thread-bound 32 page instruction booklet with simple illustrations on uncluttered, spacious layouts. While I was captured by the novelty of the instructions being visually different, when I really dove into them taking the perceptive of someone with little background experience/knowledge, they were just as hard to follow as traditional patterns instructions. 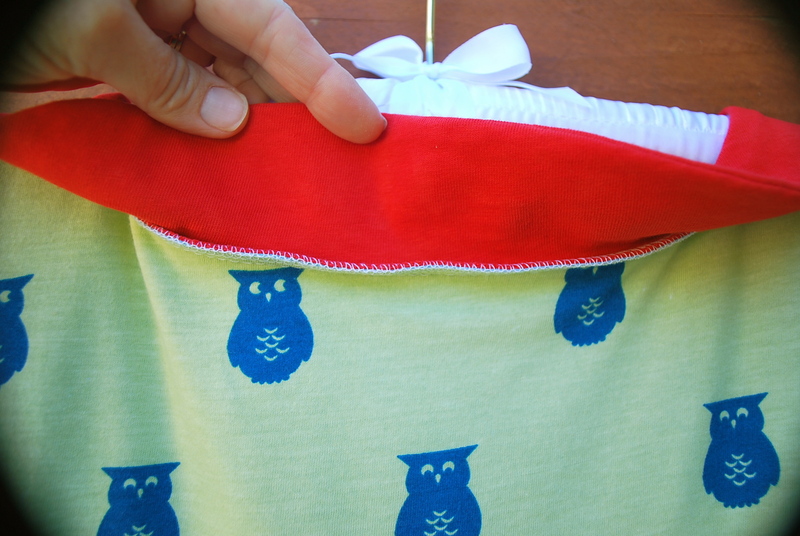 I am not knocking people who write sewing instructions for any company. I know it must be hard; I wouldn’t want to do it. These instructions also contain some shaded boxes that direct you to websites with videos that contain further instruction details on some of the main techniques. This is a good thing, but I’m going to say that I’m glad that I could rely my own knowledge rather than go watch a video. To conclude, Hanna did not pick out the fabric and did not ask me to this make this dress. I wanted to make it and I think it’s adorable, but I am not of the age or have the figure to wear it. I think she likes it; I hope she wears it. Whatever the case, it is still is joy to sew for her as I have done since she was very young.